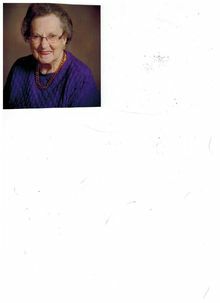 Florence L. VanDeWostine, age 89, of Prophetstown, died Friday, May 6, 2016, at CGH Medical Center in Sterling. Florence was born August 5, 1926, in Prophetstown the daughter of Glenn and Sylvia (Beebe) Brooks. She married Fred VanDeWostine on August 13, 1944, in Davenport, Iowa. He preceded her in death on January 24, 2013. Florence owned and operated The Coffee Shop in Prophetstown for five years. She also cleaned homes and was a home health care provider. She enjoyed collecting Jim Beam bottles and crocheting. Florence was a member of Leon United Methodist Church. Survivors include one daughter, Sylvia (Jim) Lane of Rock Falls; three sons, Lyle (Becky) VanDeWostine of Prophetstown, Gene (Carol) VanDeWostine of Prophetstown and Denny (Karen) VanDeWostine of Bettendorf, Iowa; one sister, Gladys Babrowski of Sterling; 13 grandchildren; 31 great-grandchildren; and 7 great-great-grandchildren. She was preceded in death by her parents; husband; one daughter; and one brother. Visitation will be Tuesday, May 10, 2016, from 5 – 7 PM at the McDonald Funeral Home in Prophetstown. Funeral services will be Wednesday, May 11, 2016, at 10:30 AM at the funeral home. Burial will be at Leon Cemetery in Prophetstown. In lieu of flowers, memorials have been established to Leon United Methodist Church and Prophets Riverview Good Samaritan Center in Prophetstown.